For those who erroneously believe that LDS poetry is primarily comprised of sentimental rhymed verses or charming couplets, this anthology is proof that the complexity and beauty of Mormon life can, and should, be rendered in powerful, sophisticated poetic expression. 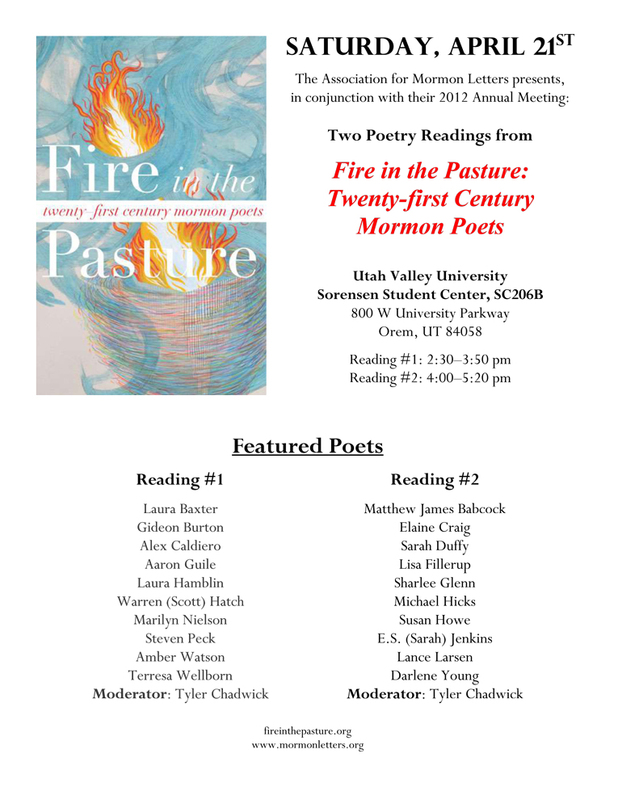 Fire in the Pasture poet Lance Larsen has been selected by Utah governor Gary Herbert as the state’s newest poet laureate. Congratulations to Lance, for this honor. Tyler Chadwick, editor of Fire in the Pasture, presenting on “Situating Sonospophy: Deconstructing Alex Caldiero’s Poetarium.” Alex, of course, is both the subject of Tyler’s dissertation and a poet included in Fire. Scott Hales, a contributor to our upcoming Dorian project is presenting “Beyond Missionary Stories: Voicing the Transnational LDS Experience”; I suspect this paper will share some ground with his incredible paper for us. Not a lot. But a little. Reception with readings by AML-award winners at the home of Charlotte England. Fire in the Pasture editor Tyler Chadwick has launched http://fireinthepasture.org/ which,to be frank, puts this current incarnation of PeculiarPages.com to shame. It’s lovely and chokkefulle of poetry, analysis, poet info, et cetera. Highly recommended for your Mormon-poetry needs. Both pages are updated regularly. On the 25th at Ken Sanders Rare Books (map), Fire in the Pasture‘s editor Tyler Chadwick will be leading readings from the book. Among the poets likely to appear at this substantial event are E.S. Jenkins, Elizabeth Pinborough, Lisa Bickmore, Alan Mitchell, Alex Caldiero, Sunni Wilkinson, Danielle Dubrasky, Sarah Duffy, Marie Brian, Laura Nielson Baxter, (Paul Swenson*), and Michael Hicks. I’ll be around for the Ken Sanders reading, and would be honored to participate. I’m still on the journey to full health, but determined to get all the way back. The book is one hell of an achievement. Thank you, Paul. It meant a lot, coming from you. We have received a report that Fire in the Pasture-poet Paul Swenson has passed. He’s been a significant poet for many decades and will be missed. If you have not been following Fire in the Pasture editor Tyler Chadwick’s scintillating and scalpellating comments on the poems of his new book, you are truly missing out. The added value of his mini-essays could well double the what you’re getting for your money. 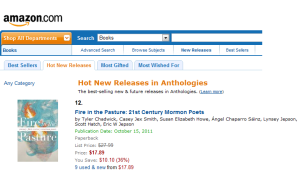 So pick up a copy of Fire in the Pasture (if you haven’t already) and follow along at home.